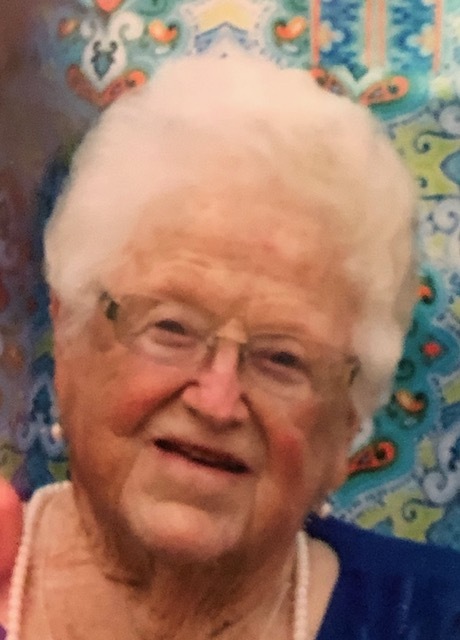 Wanda Lou Shelton Kellum passed peacefully from this earth on Friday, April 12th, 2019, at her home, surrounded by her family who loved her more than any words can adequately express. After 26 years, 5 months and 14 days, she was finally reunited with her beloved husband, Stephen Wilson Kellum, who predeceased her in 1992. We can only imagine the incredible joy that was witnessed when they saw each other again, for that first time in heaven. Wanda was born on June 25th, 1927, in Anadarko, Oklahoma. She was primarily raised by her grandmother, Mary Etta Mayes, who she lovingly referred to as “momma.” Wanda grew up amidst the trials and tribulations of events such as Dust Bowl and the Great Depression, and she would later share vivid recollections of those days, and how they shaped her into the strong, resilient and fiercely-loyal woman she became in adulthood. She loved with her whole heart and would gladly share that love with those closest to her and complete strangers, alike. Her kind and gentle nature knew no boundaries. Wanda met Stephen in 1942 when he was stationed at Fort Sill, Oklahoma as part of his service in the United States Army. He journeyed over to Anadarko to visit an Indian Fair, where they would meet for the first time. They were married on March 6th, 1943 and loved each other unconditionally for 49 years. Stephen passed away on October 29th, 1992, just 4 months and 5 days shy of what would have been their 50th wedding anniversary. Stephen would go on to proudly and bravely serve our country in World War II. A Purple Heart recipient, he was seriously wounded near the Rhine River in April 1945, and was sent back to the United States to recover at McGuire General Hospital in Richmond, Virginia. Wanda was notified of his status via telegram, and she immediately traveled to Richmond to be by his side and nurse him back to health until his discharge in in April 1946. Once discharged, Stephen and Wanda returned to Oklahoma where they would purchase their first home and start a family of their own. After the birth of their third child, they relocated back to Jacksonville, North Carolina and planted their permanent roots on Stephen’s family farm. They raised their children and lived a simple, humble, happy and full life together until Stephen’s passing. Stephen was Wanda’s “one and only” and their story, like that depicted in “The Notebook” was one of true and timeless love. Wanda’s life and legacy will live on through her children, grandchildren and great grandchildren indefinitely, and yet her passing leaves a void that cannot be filled. We will always cherish the many memories created together on Stephens Lane: Christmas and Easter celebrations, cookouts, Super Bowl parties, golf cart rides and of course, her incredible cooking. None of us have quite mastered her culinary skills, but we vow to keep trying because we know that would make her proud. She was a remarkable woman, wife, mother, grandmother, great-grandmother and friend. She will remain in our hearts as long as there are stars in the sky.Wanda is survived by her three children: Jimmy Wilson Kellum and wife, Earline; Janis Kellum Cox and husband, David (forever known as Wanda’s “best buddy”) and Jerry Stephen “Stevie” Kellum and wife, Kathy. She is also survived by her grandchildren and great grandchildren who loved her so: Jimmy Wilson Kellum, Jr. (JoAnn), Jennifer Cox Mann (Chris), Katherine Elizabeth Cox (“Katie Beth” – also known as Grandma’s “Angel”), Rebecca Cox Larkin (Patrick), Joshua Stephen Kellum (Heather), Justin Charles Kellum, Raegan Michelle Kellum (Hunter), Stephen Wilson Kellum (Tiffanie) and Mallory Stafford Mann, as well as her honorary granddaughter, Michelle Goodson. In addition, she is survived by her beloved siblings: Wayne, Letha, Freda, Sally and Linda, cousins Jackie, Donna and Bonnie, along with many nieces, nephews and extended family and dear friends that she cherished with all her heart. She was predeceased by her brother, Jack and sister, Jean. Especially in her later days, a visit from her favorite furry family members, Barney and Lowes, always brought her great joy (and she always had plenty of Milkbones on hand for their visits). A graveside service will be held for Wanda on Tuesday, April 16th at 12:00pm at Onslow Memorial Park, where she will be laid to rest next to her beloved Stephen. Family and friends who knew and loved Wanda, are welcome to join us for her celebration of life. In lieu of flowers, Wanda requested that donations be made in her memory to St. Jude Children’s Research Hospital, 501 St. Jude Place, Memphis, TN 38105 (or via their website). Wanda wanted to be sure to express her heartfelt gratitude to Dr. Thomas and Dr. Shumate, as well as Rhonda and all of her friends at DaVita Jacksonville Dialysis Center and Burgaw Hospital, who took such incredible care of her during the last several years of her life. Perhaps it was A.A. Milne who said it best: “If there ever comes a day when we can't be together, keep me in your heart. I'll stay there forever.” Wanda made an incredible and lasting impact on this world and in our hearts she will be. . . . .forever. Forever loved, forever missed and never forgotten.